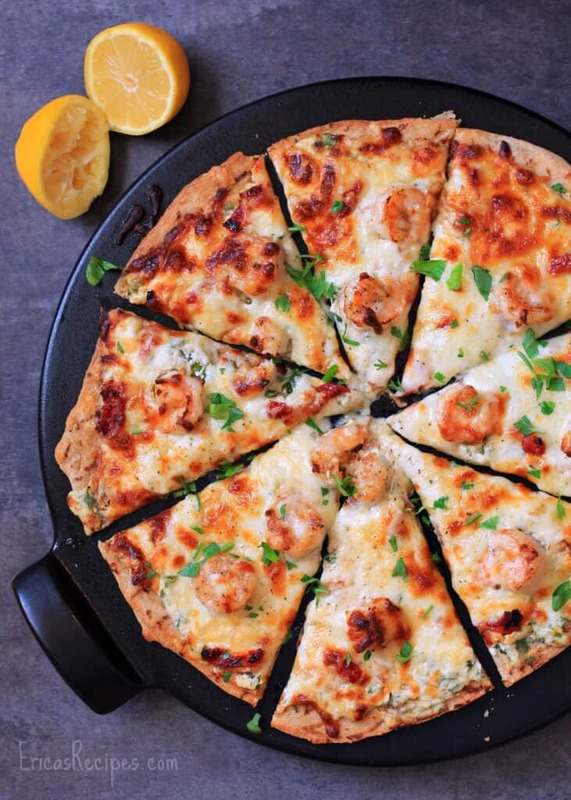 With a creamy ricotta pizza sauce and lemony, garlicky shrimp, this Four Cheese Shrimp Scampi Pizza is decadent, different, and DELICIOUS. I think on the eighth day, God made pizza. What other explanation could there be? I’m even willing to bet it follows divine proportion somehow. Everything works on pizza …because bread and cheese go with everything. So as a rule, pizza is always awesome. 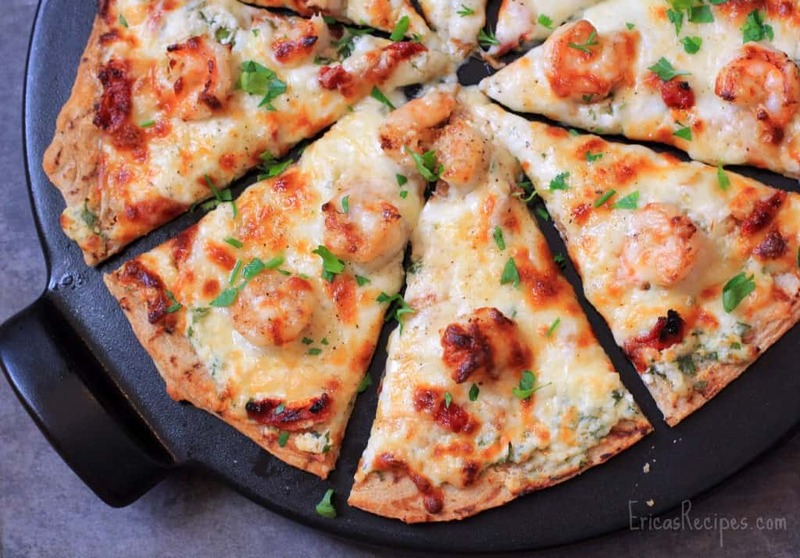 Succulent, versatile shrimp is outstanding on pizza. I put shrimp on my Cajun Pizza with Andouille and Shrimp, which was amazing. 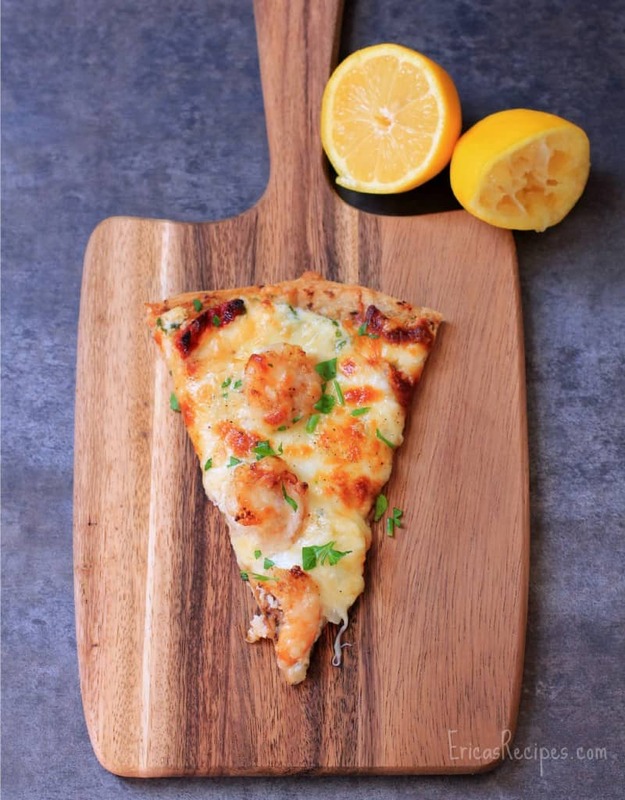 And for this recipe, I’ve used shrimp in a quick scampi with fresh lemon and plenty of gah-lic on a pizza. This is my answer for keeping our Friday pizza night during Lent. Thank you God for the idea! Heat the pizza stone in the oven set to 425F. Once the oven is heated, continue to heat an additional 10-15 minutes to be sure the stone is properly heated. In a bowl, combine the ingredients for the ricotta sauce. For the shrimp, heat the butter in a large, nonstick skillet on high heat. Once the butter starts to bubble, add the shrimp and garlic. Spread the shrimp in a layer and cook briefly to just sear one side, then flip to sear the other (you want to just brown the sides and leave them raw in the middle - they'll finish cooking in the oven). Add the lemon juice and cook briefly to reduce the juice a bit. Remove from the heat. Take the pizza stone out of the oven. Lay out the crust on the stone. Spread the ricotta sauce over the crust. Top with the shrimp and all the garlic-butter. Top with the sun-dried tomatoes and cheese. Finish the top with a little pepper. Put the stone with the pizza back in the oven and cook 10-15 minutes until crust is crispy and cheese is lightly browned and melty awesome. Yield: 4 servings. Erica this looks unbelievably delicious and your photos are really beautiful! What kind of pizza stone is that? Looks like cast iron–really cool! fantastic pizza! it looks absolutely gorgeous and I love the idea of the pizza recipe… I’m always looking for a new pizza recipe to try you know me with my eclectic tastes! Erica, I am so with you on the eight day–pizza should be its own food group! And I am totally drooling over this gorgeous pie, especially since shrimp scampi is involved. This looks like the perfect candidate for my weekly pizza night! Erica, this looks delicious. I like the ricotta mixture you’re using instead of sauce. 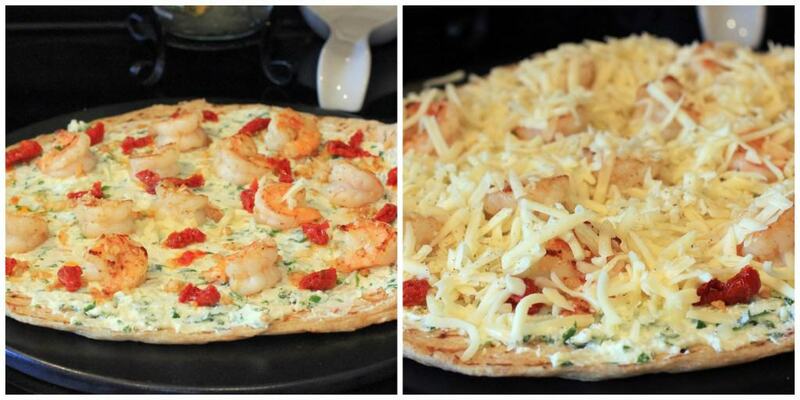 Shrimp Scampi is a great dish and this pizza looks just as yummy. Thanks Erica for such a Fantastic Recipe! Cannot wait to try it! We featured it today in the Food is Love Recipes Pizza Party! I was just going through and visiting some of the links from our Let’s Get Real party and saw this there! I shared already on G+ because it caught my attention and sounds amazing! You just can’t go wrong with shrimp 🙂 I can’t believe I’ve never thought to make it on a pizza before. Great recipe! This sounds divine. I chose it as my host favorite for this week on Foodie Friends Friday, so it will be featured tomorrow on Daily Dish Magazine. Thanks for sharing! This looks delicious! Thanks so much for sharing with the Let’s Get Real party this week.